It's not every day I get to visit a beef ramen shop. Jinjo Menya Gyukotsuo happened to open up in Nagahoribashi, though, so I stopped by to try the beef bone paitan ramen. It was advertised that there was no pork or chicken in this bowl, only beef, and it tasted it. It was strong and syrupy, tasting not unlike beef tendon, topped off with some crushed pepper. 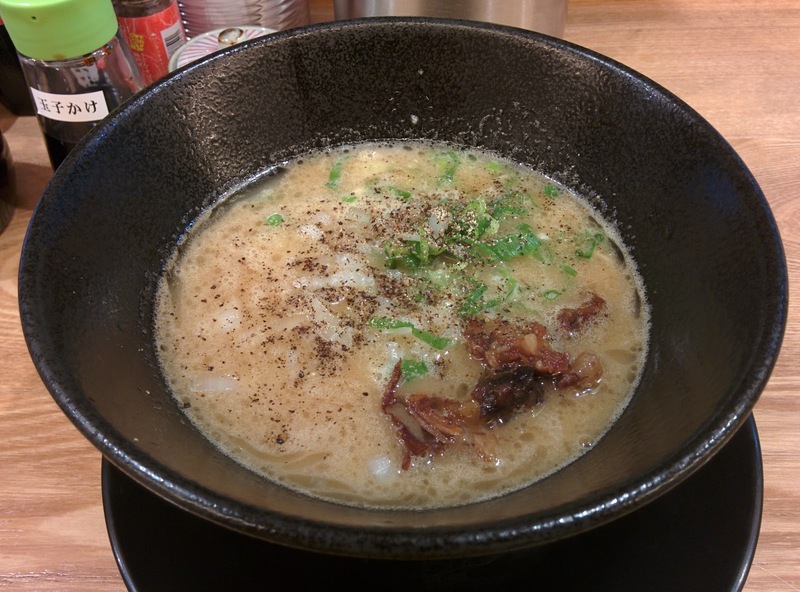 The noodles were bunched up, thin and firm, like giving beef bone ramen the Hakata treatment. Speaking of beef tendon, there were little niblets of beef innards in the soup, chewy and gelatinous. Yes, I'm curious about their other beef concoctions. Anyone feeling beef or avoiding pork should stop by.